If you know us, you know we have a deep passion for renovating our older city homes. Kassina, our owner, has lived in St Paul for over 20 years and loves everything about its history. 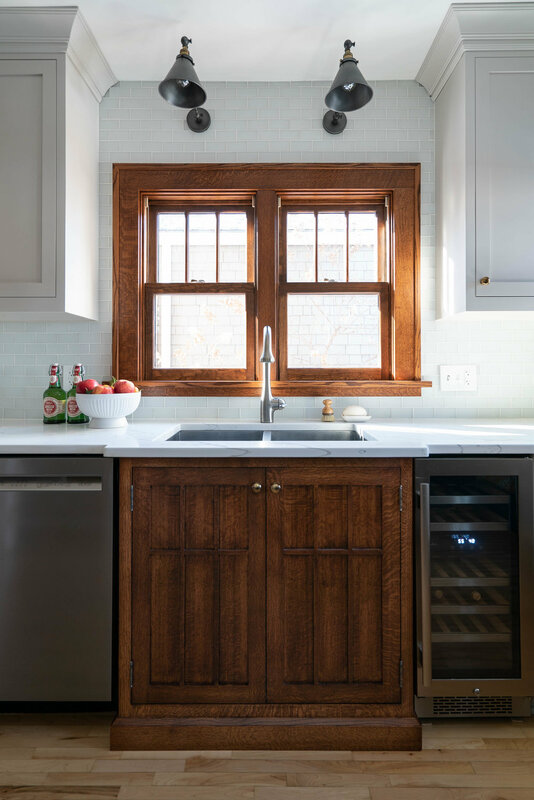 So when another Craftsman kitchen project was sent out way, we were excited to jump right in. These homeowners were pretty common in that they both liked some of the same stuff, but then had some really different preferences, too. This kitchen was a continual balance between their two styles. Overall they have a very modern aesthetic, think the modern line at Room and Board type stuff. Gorgeous. Bold yet simple at the same time. Lot’s of color and texture. 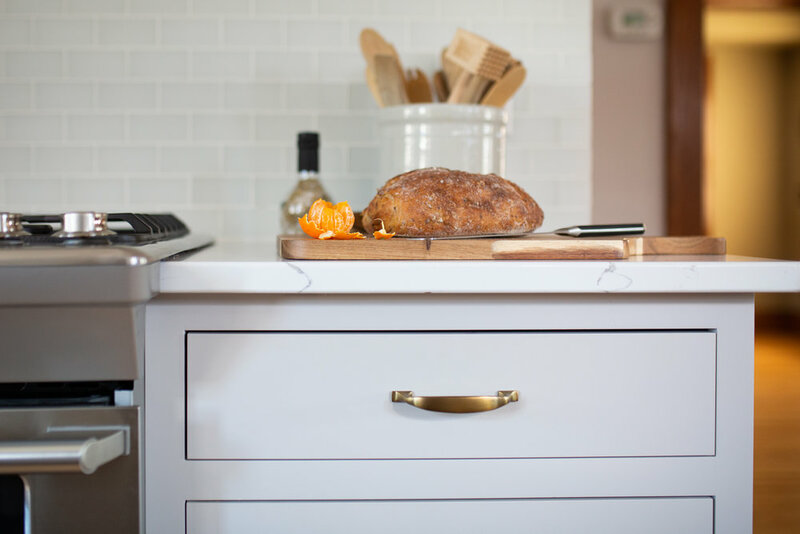 But, they understand the value of keeping our history in tact, too, and wanted to make sure the kitchen was both a reflection of history and their taste. Before we dive into the design plan, let’s soak in this gorgeous after shot, shall we? The entry to the kitchen was just a regular sized doorway as you can see in the first picture. The kitchen is your typical galley style and then in the back right is the rear entrance to the house. The client knew they wanted to open the entrance to the kitchen but weren’t sure if they should do the full wall or just the upper part of it on the stove side. And this is where I want to do a video to walk you through of the design with you to illustrate how much thinking and minute planning we go through, especially for places like kitchens and bathrooms. The smallest change can make the biggest impact. In this case, by opening up the wall (it was about 8” thick) we were able to completely reconfigure the kitchen, nearly double their storage at the same time as eliminate the small uppers you see above their sink, and forego any uppers on the stove wall so that we could create a beautiful and modern wow-factor. By eliminating both of these uppers the kitchen feels more open, too, which is important in a smaller galley kitchen. The stove focal wall has the stove perfectly centered leaving just enough space to tuck the microwave down below (tip: we can’t stand microwaves up top, especially over ranges.) And lastly, this new layout allowed us to put the fridge on the stove wall and then give them a pantry on the sink wall. 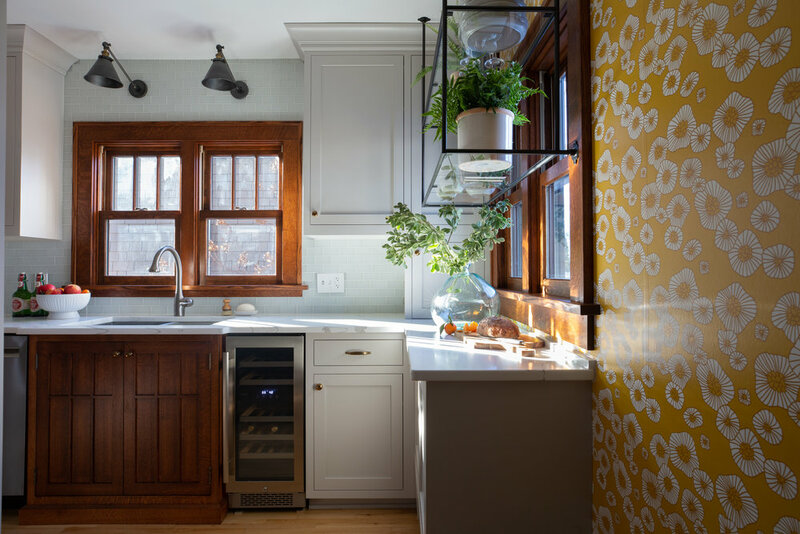 To make the sink wall symmetrical we put the uppers down onto the countertop on that back wall and then turned the cabinetry and did a furniture-like shallow unit under the window with a custom metal and glass shelving unit up top. It may seem like a small touch, but by putting that cabinet under the window and the shelving unit up top, we were able to give them a ton more storage but also give another beautiful focal point to the kitchen as that back wall is what you see from the dining room. One of the homeowner’s wanted painted cabinetry while the other wanted wood. So to compromise we did a bit of both. To keep with the style of the home, we designed the sink cabinet to look just like the dining room hutch. The wood moulding on the front of the doors match the hutch’s exactly, as does the footed base. And then we got new windows and trim, again that match the rest of the house perfectly. But then for the painted cabinetry we did a warm mushroom color. 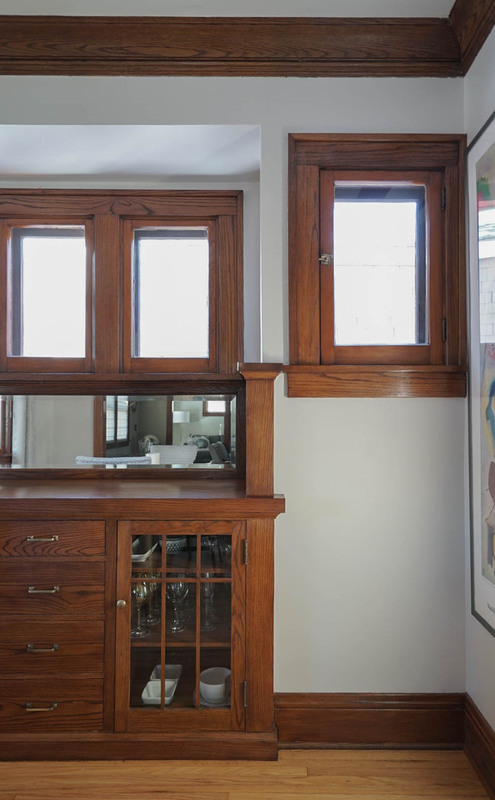 And by not having any uppers on the stove wall, we didn’t have to worry about any painted crown moulding butting up to the dining room’s original wood moulding, something that in our opinion, is a big no-no. The homeowner’s wanted to keep their stove, sink, dishwasher and faucet. But got an extra tall fridge so that it somewhat hides the stair drop-down in the ceiling and a new microwave that could be built into the cabinetry. We suggested either a patterned tile or wallpaper for the back wall. This homeowners found this paper and it’s the biggest way we brought in their modern flair into the space. We suggested a stone hood to match the cabinets like you see here and then for the backsplash either a full slab of the same hood/countertop material or tile. We ended up choosing a clear matte glass tile that was so new to market I think we were the first to use it! Lastly, the lights and hardware bring in some antique touch as well as a little bling. And by going dark with the sconces and shelving unit it brings that dark accent you get in the stove and microwave around the rest of the kitchen. And that’s about it! We hope you love this kitchen as much as we do. Keep up to date on and all of our projects by following us on Instagram, Pinterest, email (see footer!) and our blog with Bloglovin'! PS - we do lot’s over on Instagram, including all the behind-the-scenes as we go through each project. So come on over.